Of course cogglufi should ring a bell. Forgetful of me - it was only last June / July we saw this same 7A38 / 7A48 Franken before. It's got it's own separate dedicated thread, started by Riccardo (jk13): Franken 7A48 / 7A38 on Italian Ebay - Caveat Emptor ! 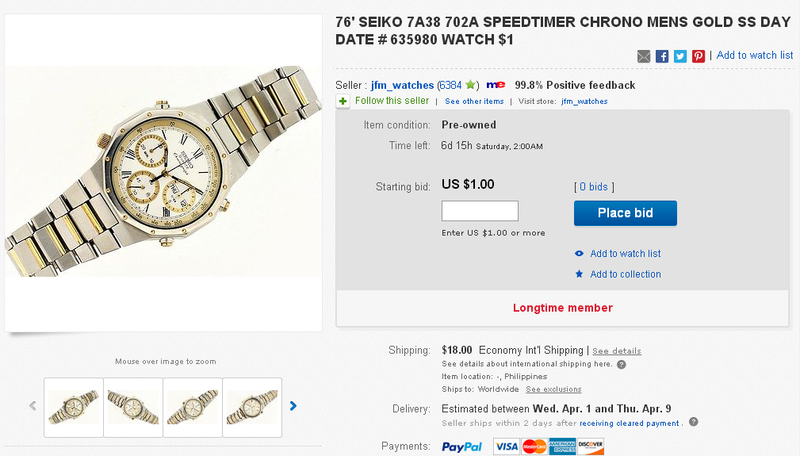 .... which goes on to demonstrate that eBay seller cogglufi is one of the most blatant exponents of shill bidding EVER ! 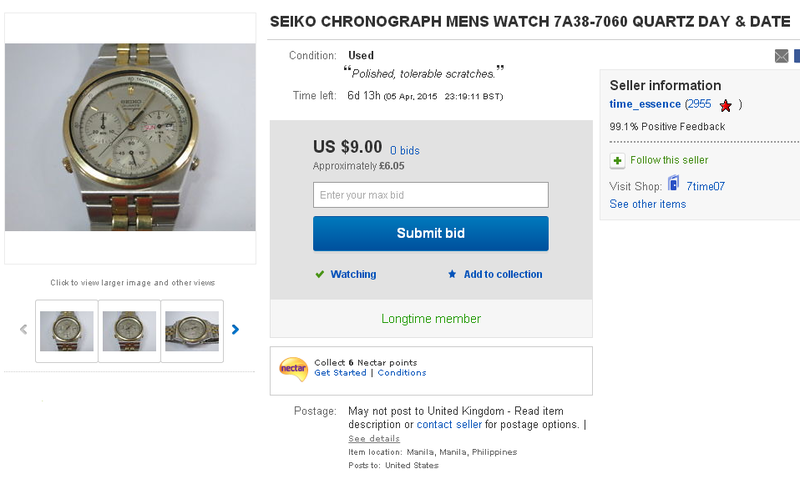 Speaking of 7A38-702A based Frankens, here's the latest mash-up listed overnight by Filipino arch watch botcher jfm_watches. 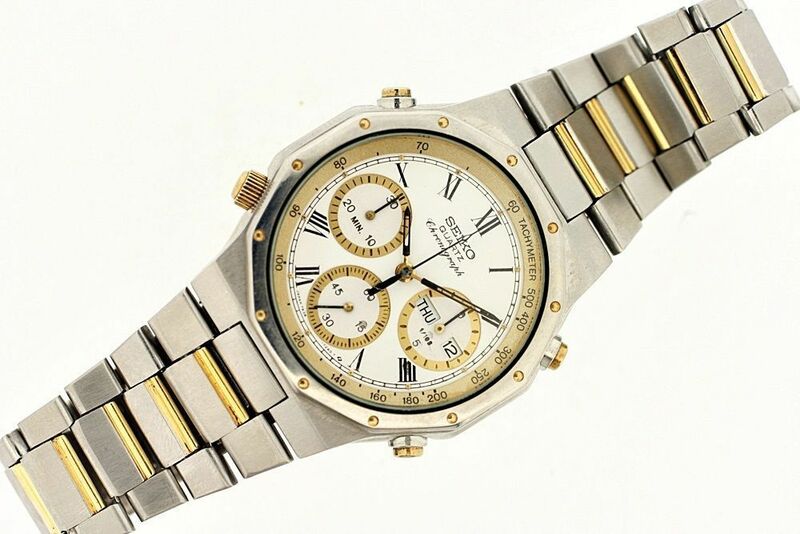 It's been fitted with a 7240X914 white Roman numeral dial out of a two-tone 7A38-7289 / -728A. 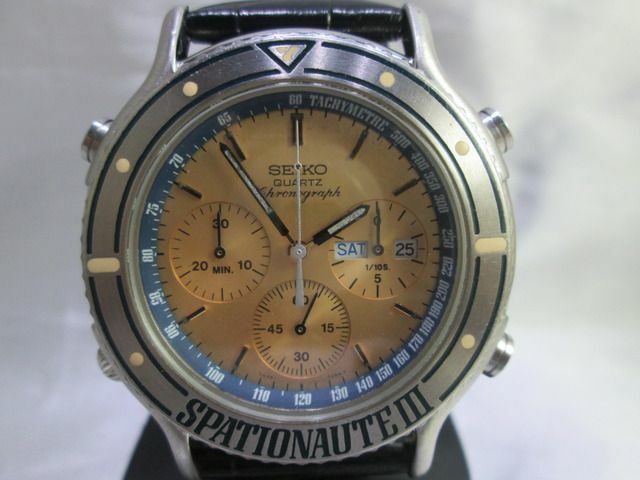 But the hands aren't correct for that dial (and minus their lume). 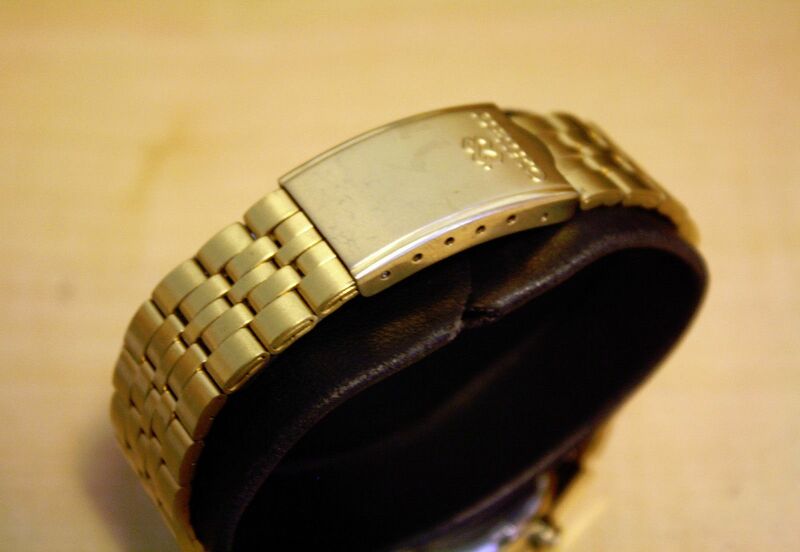 The stupidest thing is that last night he also listed another 7A38-702A eBay item # 351341129781 which is in overall worse condition and fitted with an after-market bracelet, but has the correct albeit slightly scabby gold 703LXG18 dial for a 7A38-702A. 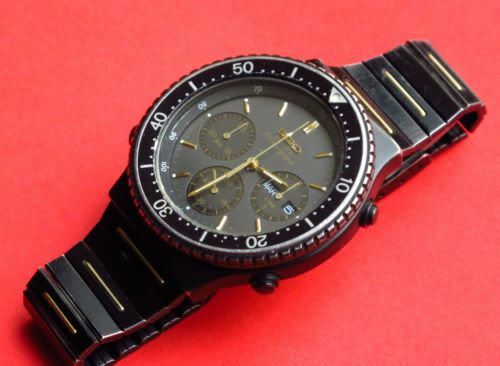 So he could have made one almost decent correct watch, instead of turning out two more typical Hotch-Potch efforts. 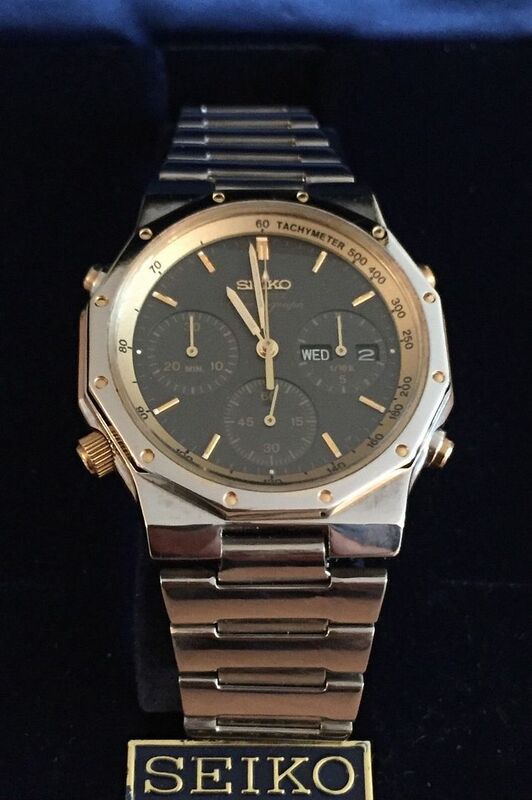 Simply because it looks very similar to the original watch - which was a two-tone 7A38-7280 with a light grey dial. 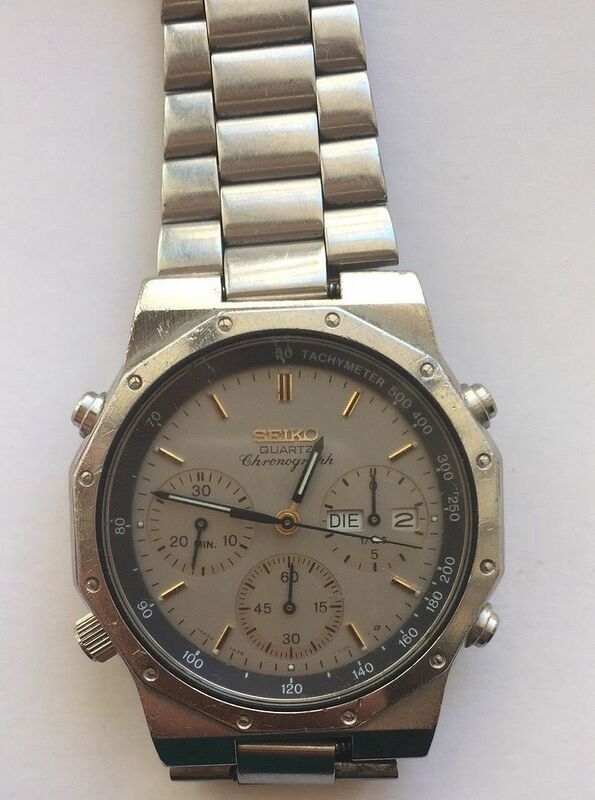 It's been fitted with the silvery-grey 708L dial, hands (presumably movement) and case-back from a two-tone 7A38-7060 - hence the seller's listing title. 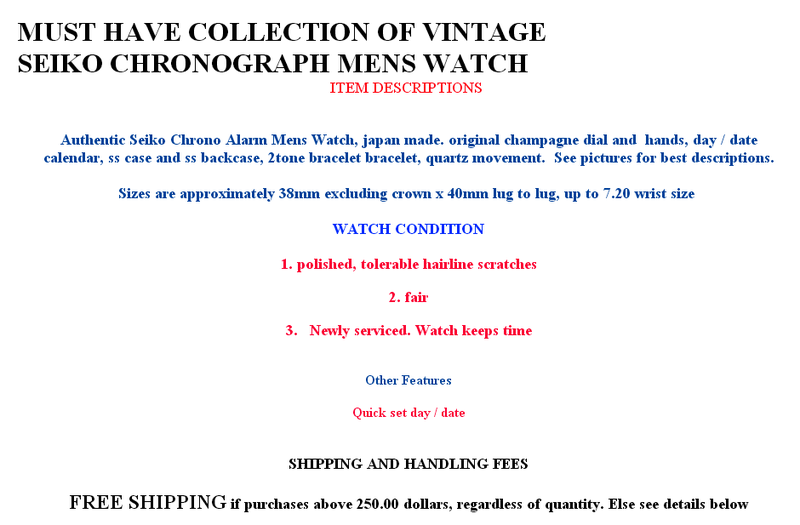 Why is it eBay sellers seem so reluctant to use the F****** word ? 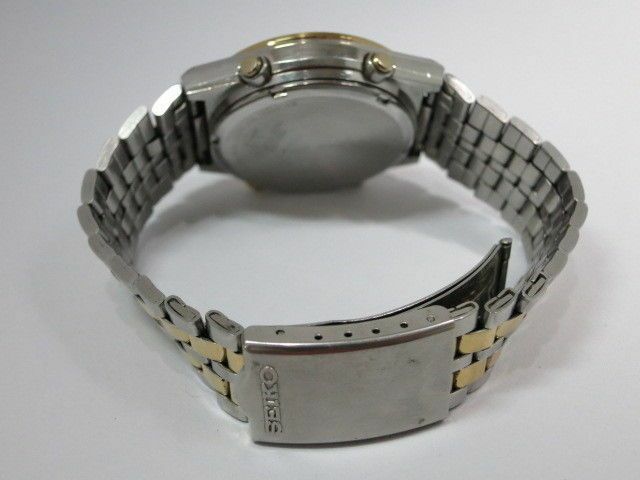 Case: 37mm PVD coated metal case with original finish. 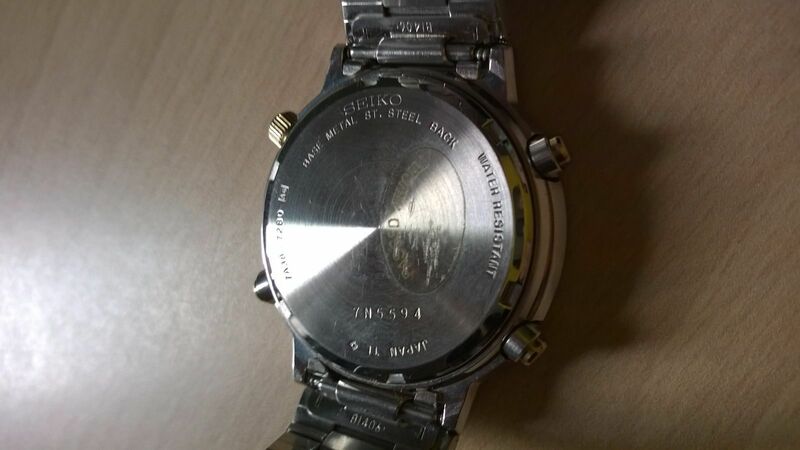 The case has wear and scratches. 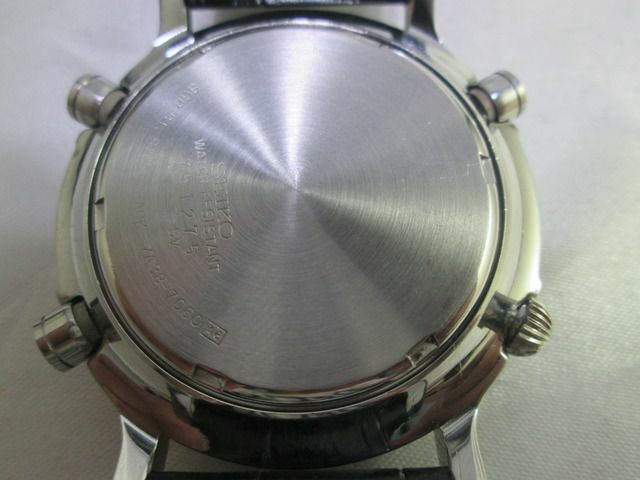 Stainless steel back. 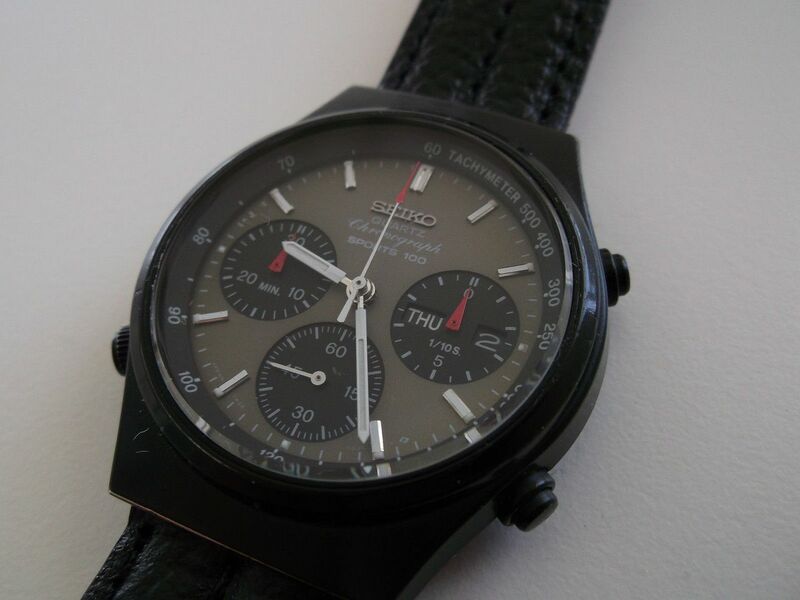 Dial: Seiko light-grey dial with black subdials and tachymeter bezel. Custom red chronograph hands. Crystal: Mineral crystal with a few light scratches. Band: 18mm black leather band. Movement: 7A38 quartz chronograph movement with 1/20 second counter. English/Spanish day and date display. Chronograph, split, reset, and demo all work (serviced August 2013). 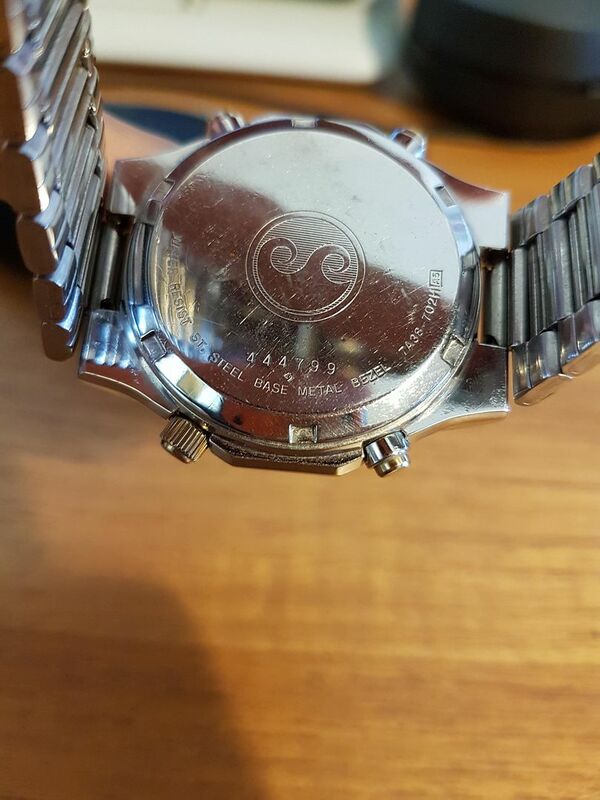 Condition: Pre-owned custom watch with signs of wear. 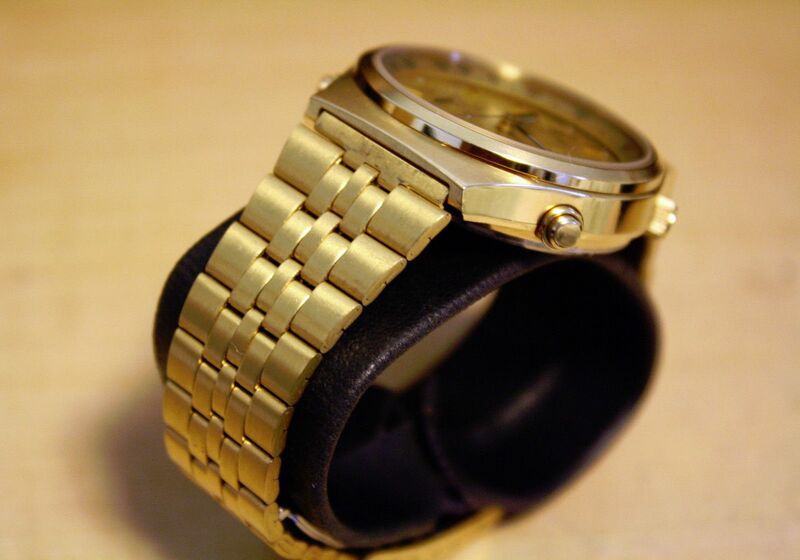 Watch is fully functional and ready to wear. No international shipping. It's basically the 703L dial and (most of the) hands, plus Tachymeter ring from a 7A38-7029, installed in a 7A38-7180 watch case. 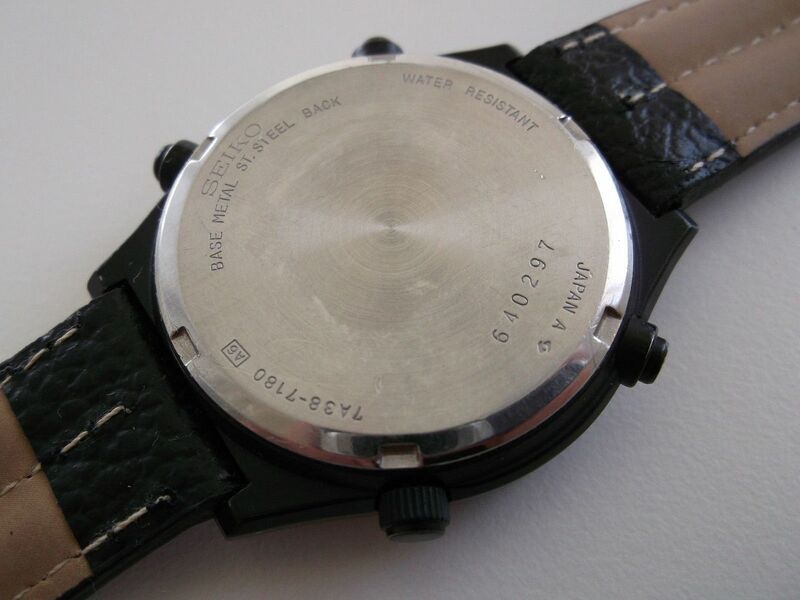 The movement is presumably also from the 7A38-7180 donor, because it has white lettering on black day / date wheels. At $60, it represents something of a bargain, especially when compared to those over-priced 'designer' Frankens by starsinthedirt. Surprised it was still there, by the time I got around to writing it up a couple of hours later. Belated Edit: It sold about a hour after I posted that. 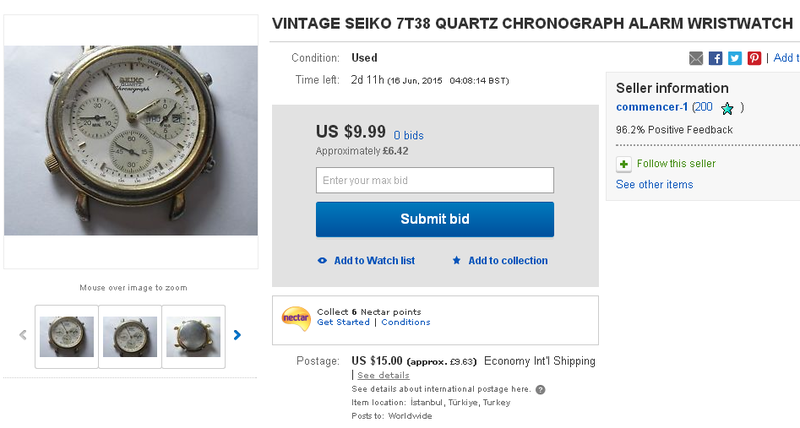 This fairly lacklustre 7A38 Franken was listed early this morning by a Spanish eBay seller. 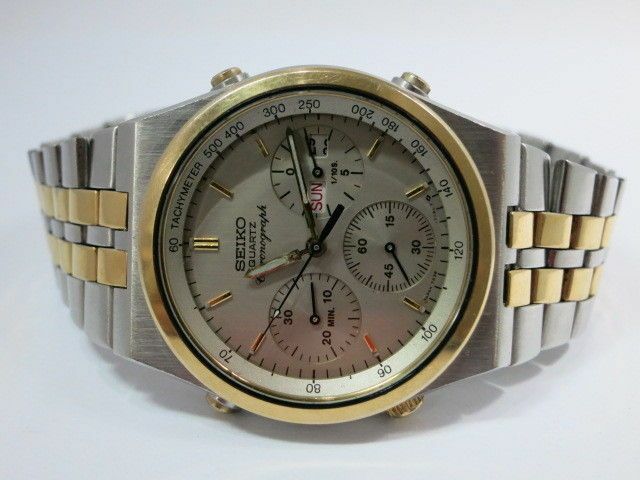 RELOJ SEIKO CRONOGRAFO 7A38 FUNCIONA, POR SU ANTIGUEDAD NECESITA ALGUN MANTENIMIENTO, CORREA SEIKO PERO NO SE SI SERA LA ORIGINAL DEL RELOJ. EN BUEN ESTADO. 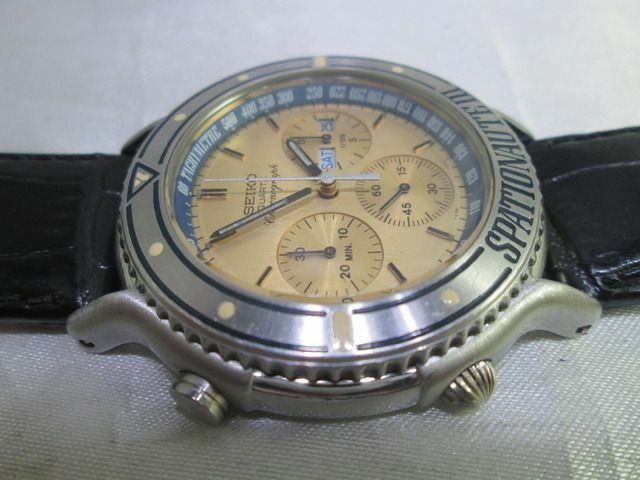 The watch case and Tachymeter ring are from the original stainless 7A38-7020. 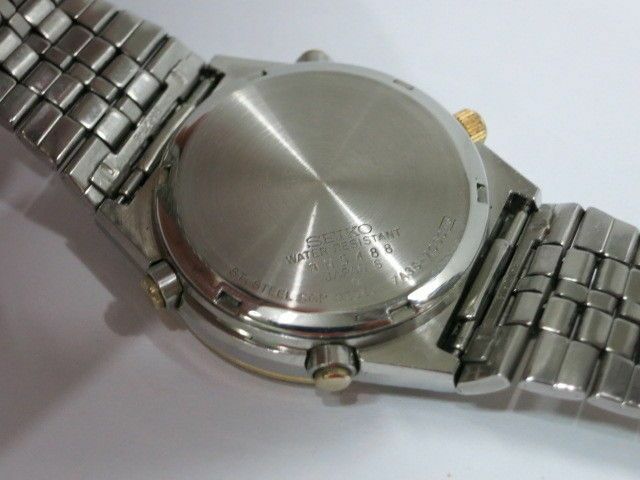 The grey 710L dial, hands and presumably also the movement are from either a two-tone 7A38-7190 or 7A38-7280. 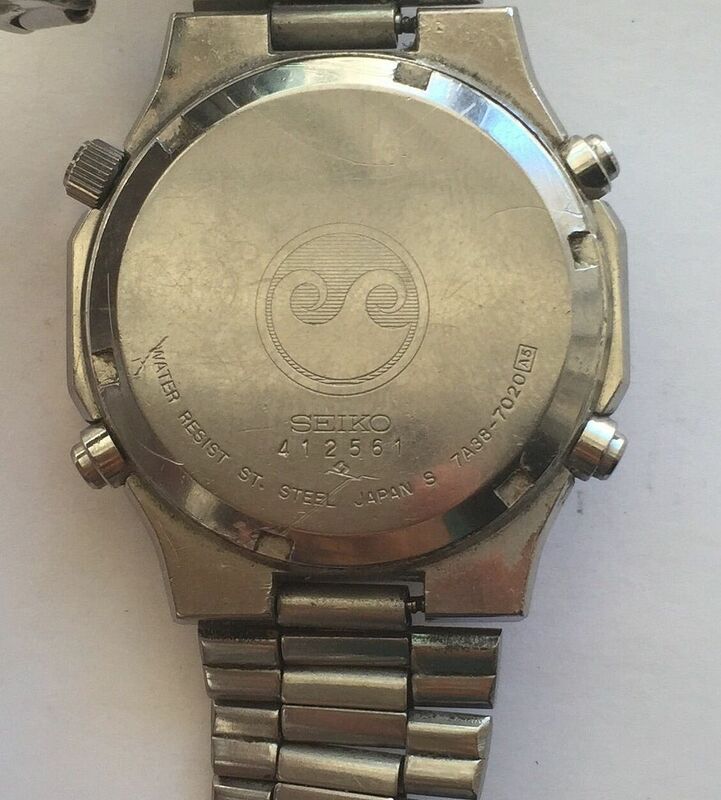 According to the seller, the non-original bracelet is Seiko, but looks more like some cheap aftermarket thing, which doesn't fit the 10mm lug width particularly well. Question: When is a 7A38 not a 7A38 ? 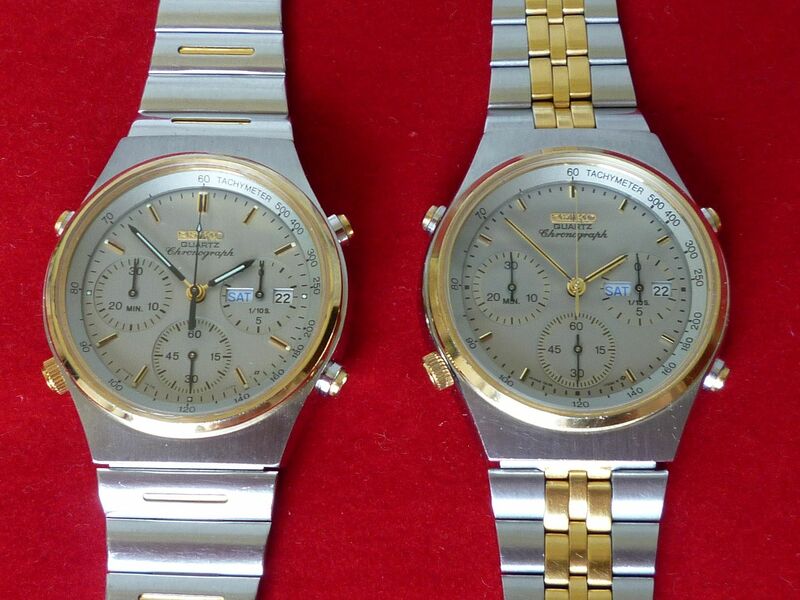 Answer: When (according to the seller) it's a 7T38 - or in reality a Franken: part 7A38(s) and Orient J39. I stumbled across the listing for this horrible hotch-potch mess, by a Turkish eBay seller by accident, this afternoon, though from the 88 views the listing has received so far, plently of other people had already seen it - and looked the other way. 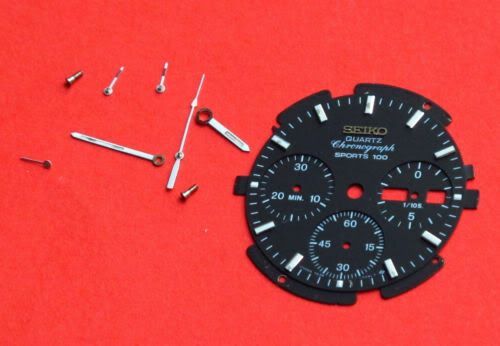 The off-white 723O dial, hands, presumably movement and crown are from a two-tone 7A38-7270. 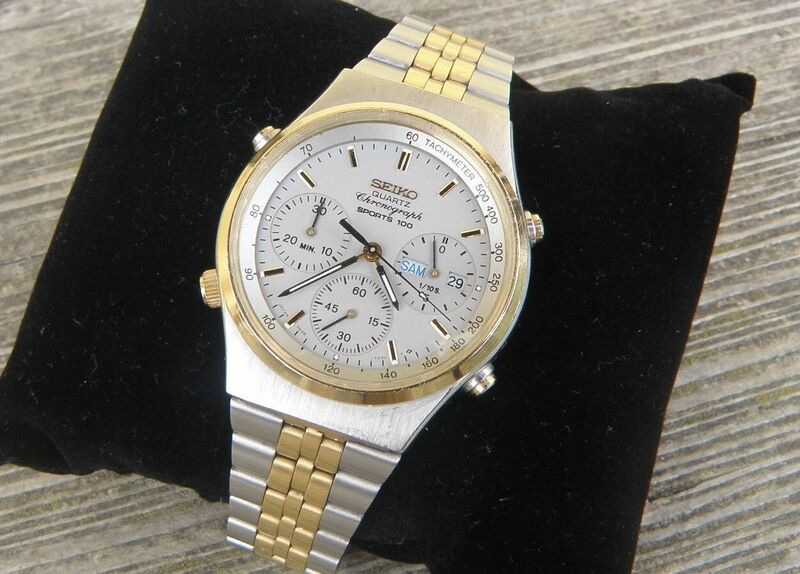 The well worn gold-plated case and chipped Tachymeter dial ring are from an Orient J39908-70 - topped off with the case-back off a two-tone 7A38-7060. Pushers could be off any of the three (but stripped of their gold plating) and going by the differing amounts by which they protrude - probably are ! 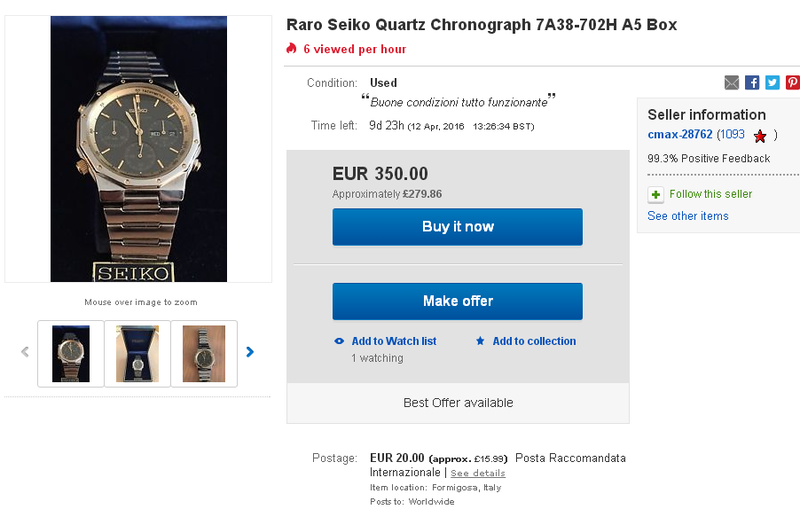 I've always said that subtle Frankens are the best - and this apparently well-executed Franken which appeared on eBay Italy yesterday evening is very subtle. 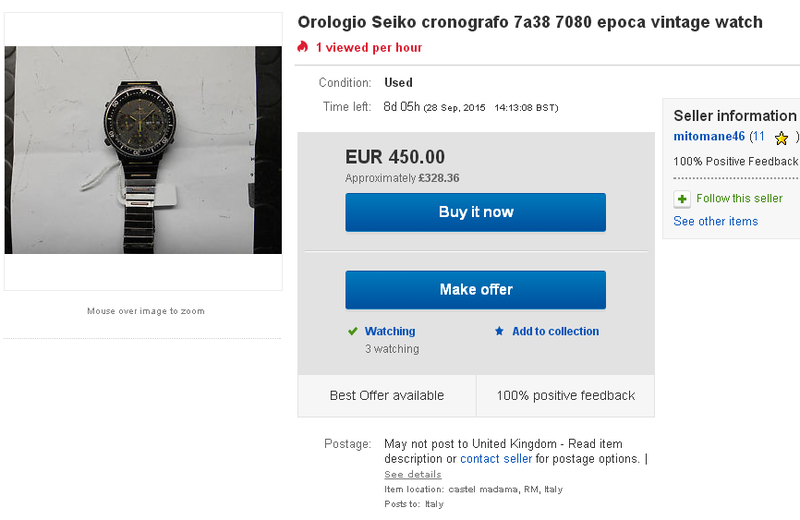 Were it not for the dishonest seller's greed, in asking 350 Euros for his creation, he might even have pulled it off. Not the first time we've seen a 7A38 into 7A48 Franken, by any means - nor I'm sure will it be the last. 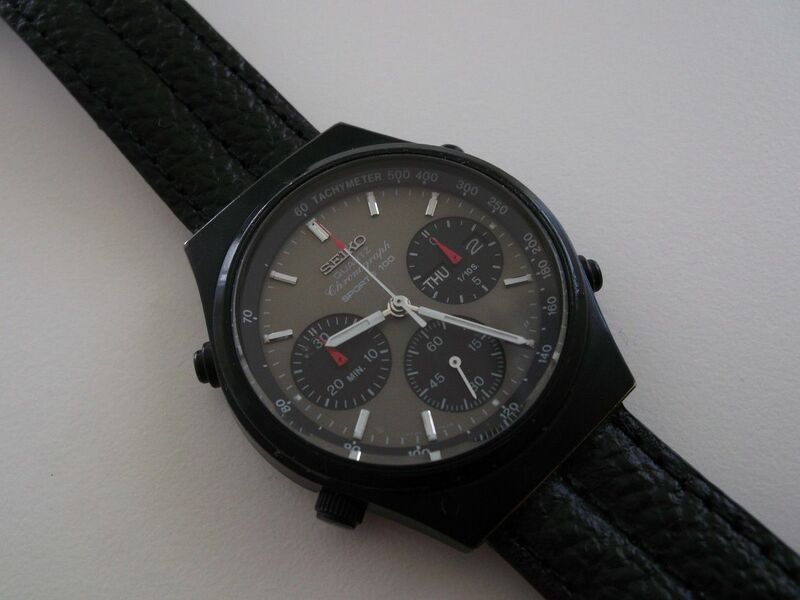 For those novices who might be unsure what they're looking at, it's the grey 710L dial / movement; Tachymeter ring and case-back from a two-tone 7A38-7280 (hence the listing title) fitted in the watch case and bracelet (whose p/n B1406 is visible in the third photo) of a two-tone 7A48-5000. 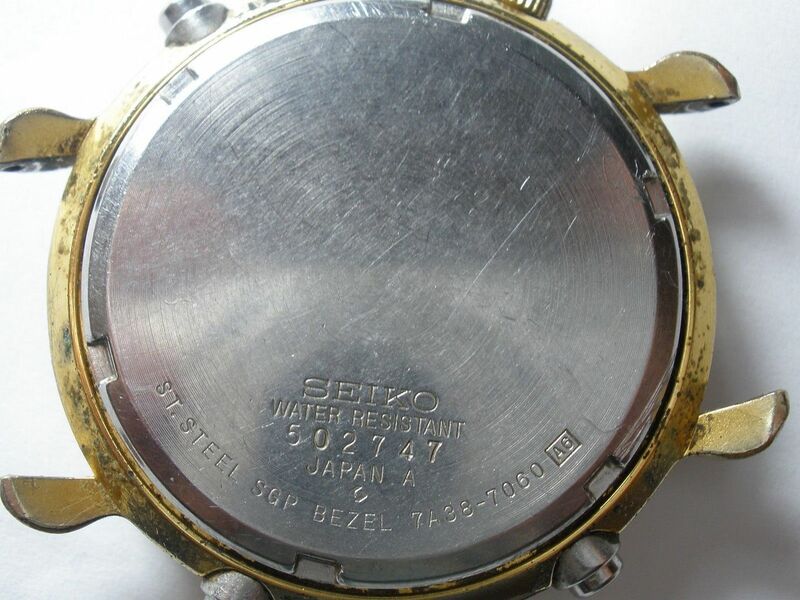 The hint of Seiko hang tag in the first photo is a clever deceptive touch, adding to the false 'NOS' claim. 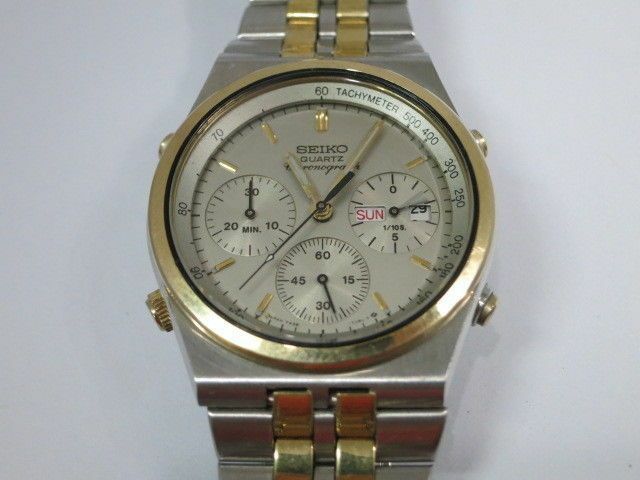 Up for sale this lovely Seiko 7A38 7020 Quartz Chronograph from 1987. 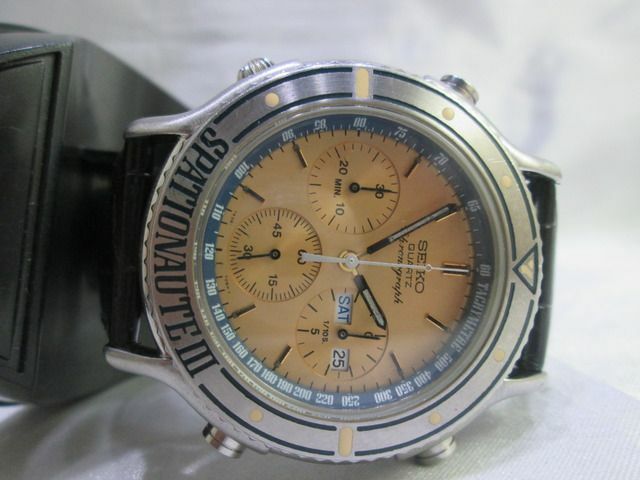 One of the best quartz chronograph ever made!! 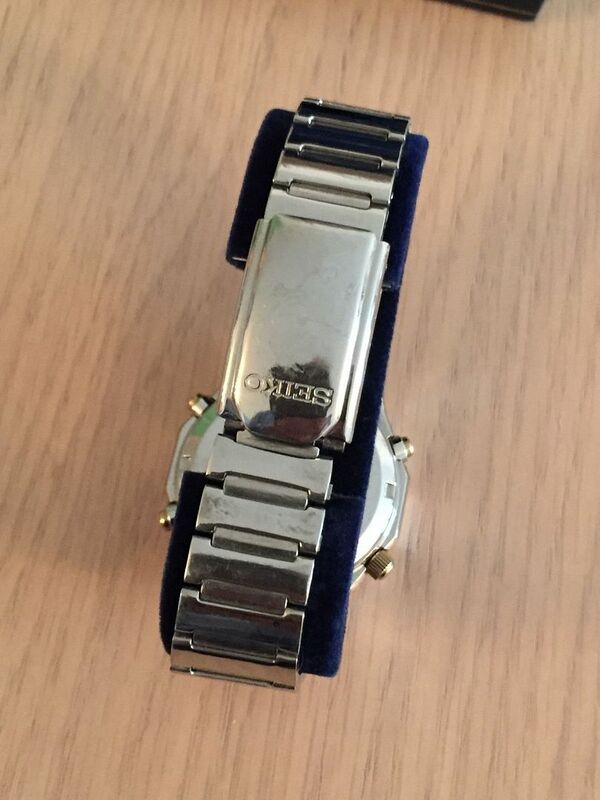 The watch is NOS, but with no box or instructions. Feel free to contact me for every question. 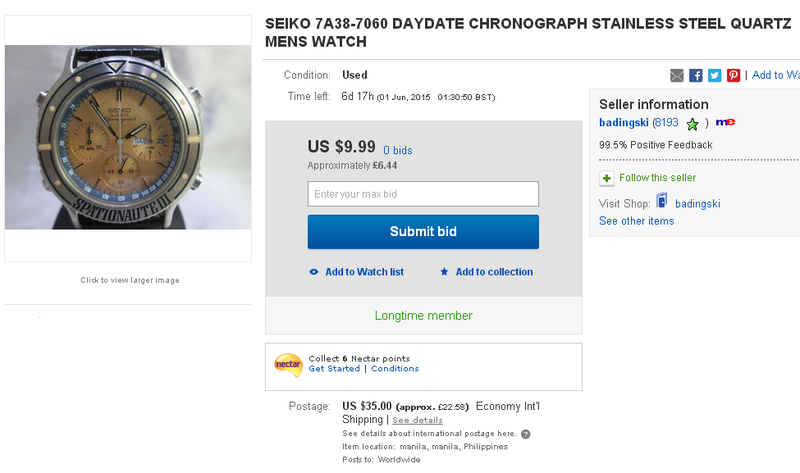 Check my other auctions for other vintage watches! 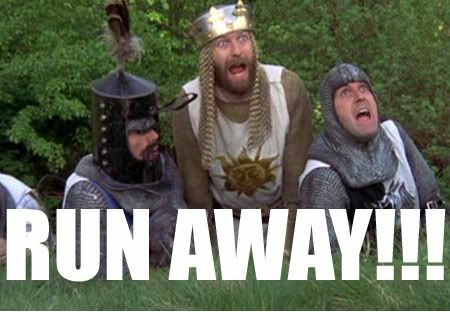 At the risk of repeating myself (again) .... I've always said that subtle Frankens are the best (meaning from an aesthetics viewpoint). However, if you're capable of producing something that looks presentable and is not too dissimilar to a correct original Seiko 7Axx configuration, a dishonest seller stands a far better chance of passing a watch off as 'original' and getting a decent price for it. Indeed, in years gone by, I've been caught out myself a couple of times, in my early collecting days - as an uninformed 'newbie'. 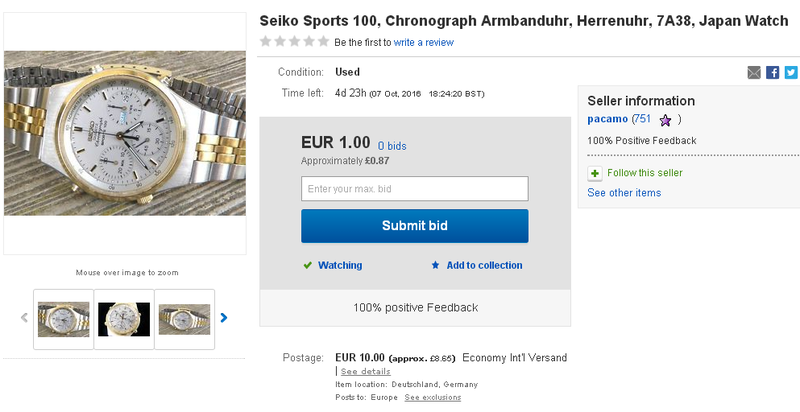 Schöne Herrenuhr von Seiko zu verkaufen. Sie ist in gutem Zustand und weist lediglich leichte Gebrauchsspuren auf. Es wurden neue Batterien eingesetzt und von außen gereinigt. Das ist ein Privatverkauf, daher gilt kein Anspruch auf Rückgabe, Garantie, Umtausch und Gewährleistung. Vielen Dank für ihr Verständnis. 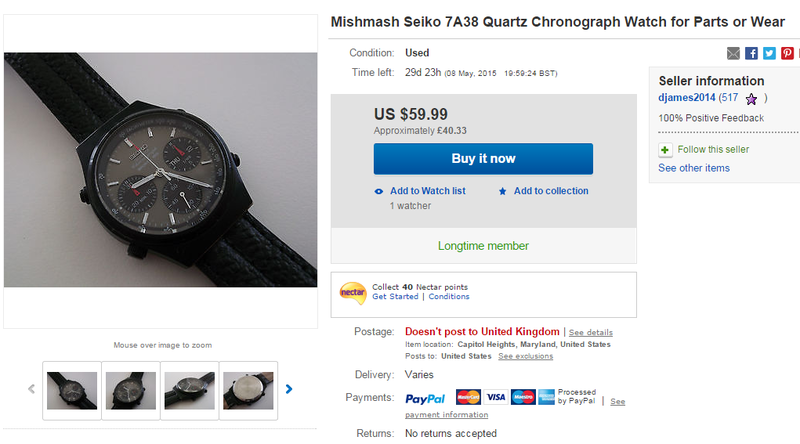 You'll note that the German eBay seller cleverly makes no claims for the watch's originality. 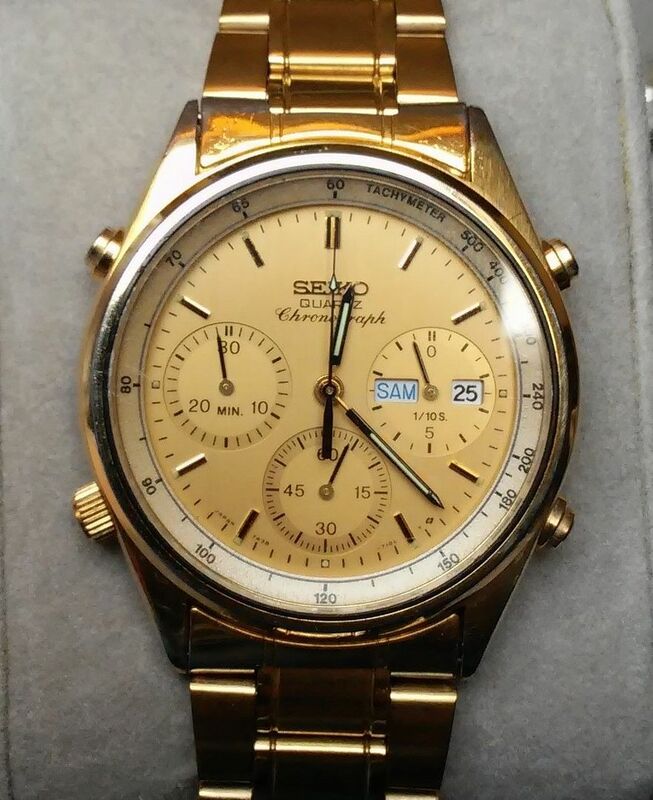 The obvious giveaway being the gold painted rings around the sub-dials and the slightly larger than normal gap between the minute marks and Tachymeter dial ring. 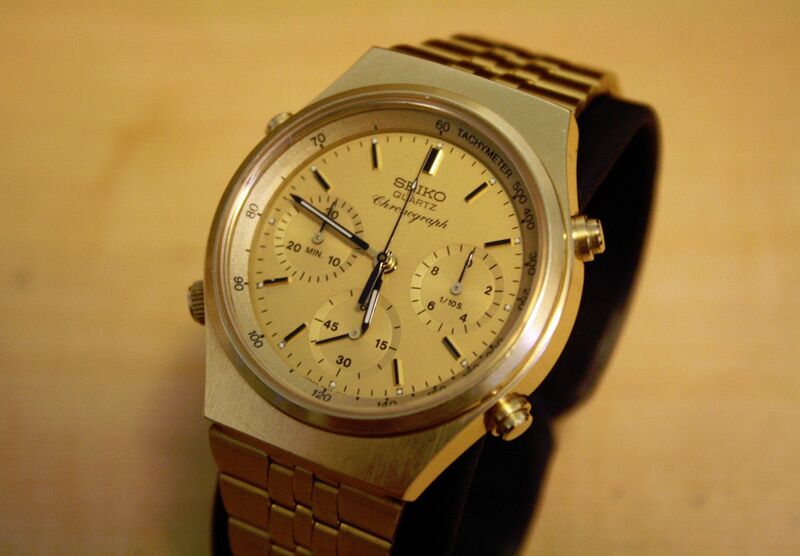 The gold dial fitted is a 710L - not as you might at first expect from a common-or-garden gold tone 7A38-7190. 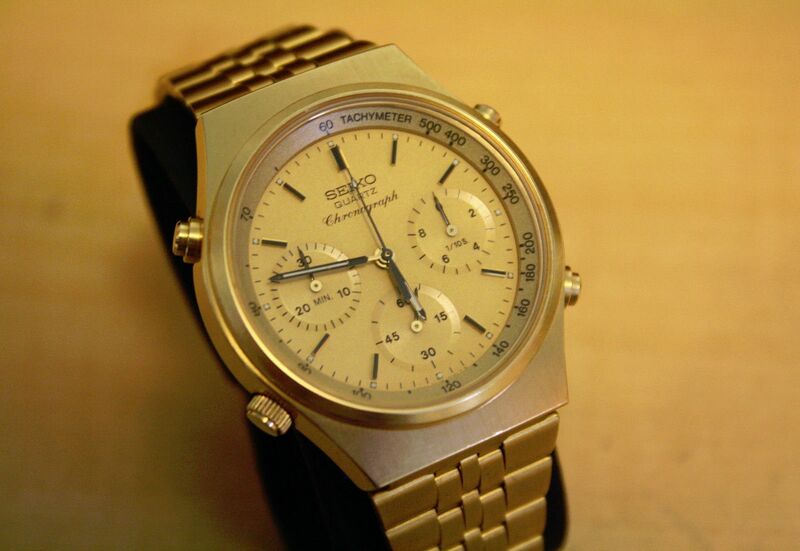 The gold bosses of the sub-dial hands point to the donor of the dial / movement being a gold-tone 7A38-728A. 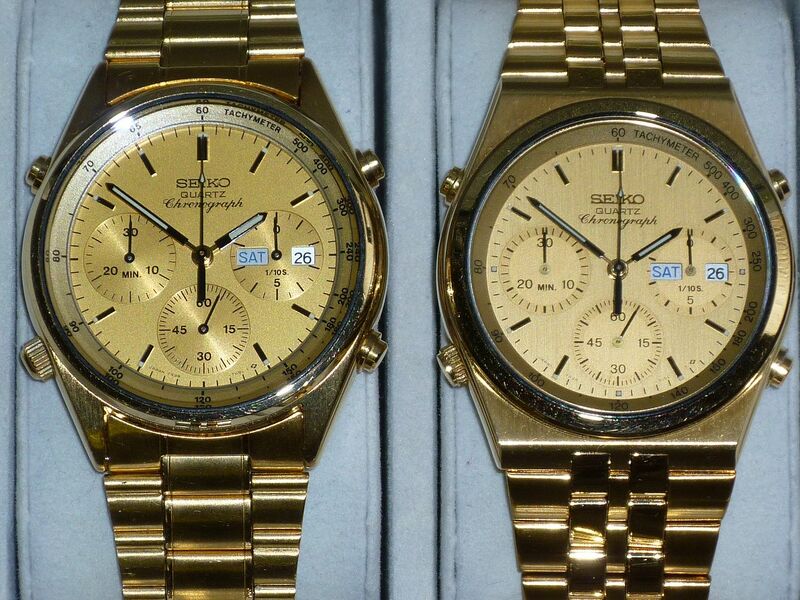 For comparison, here's a Q&D shot of a gold tone 7A38-7060 with the correct 708L dial (and hands) next to a 7A38-728A. 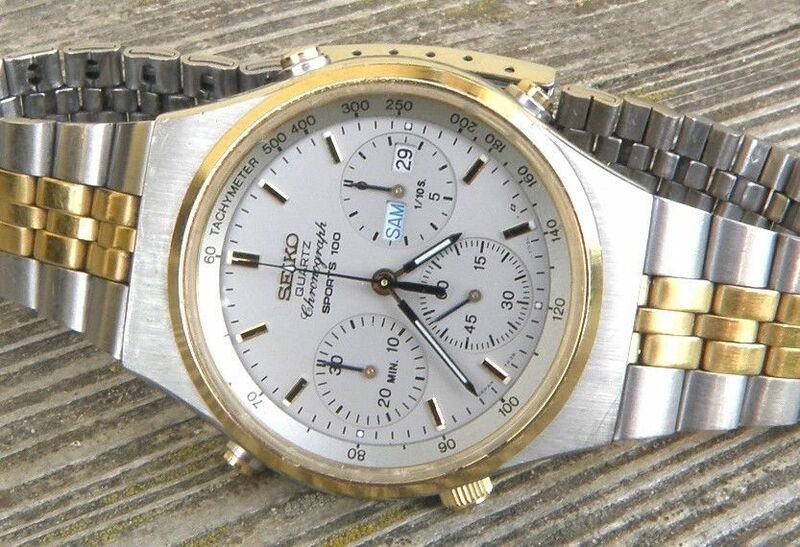 Although I've seen (and purchased) a couple of fairly unique, undocumented Seiko 7A38's, which I strongly believe were models conceived for the Italian market .... 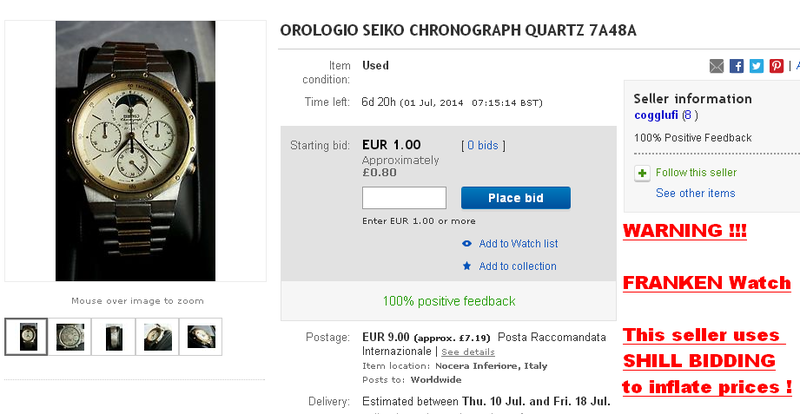 I'm pretty sure that this one, which was listed on eBay Italy yesterday doesn't fall into that category. 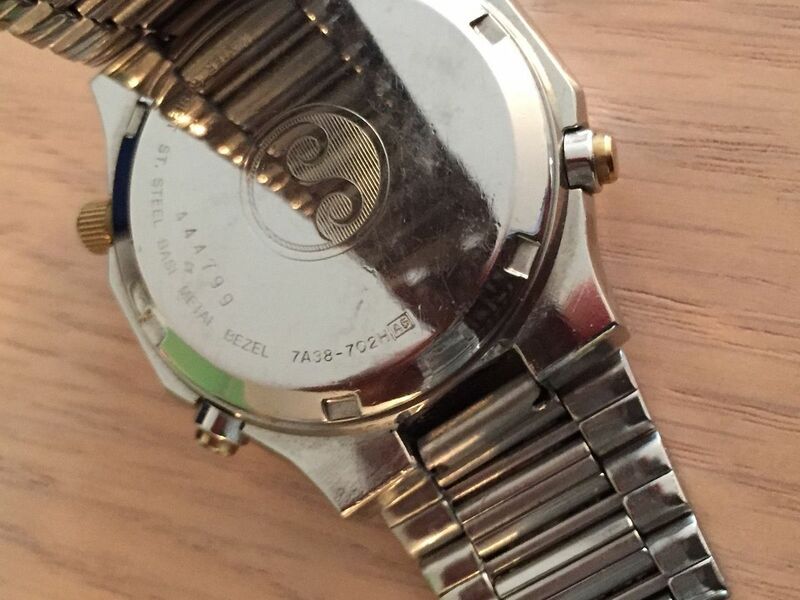 Unless my eyes (and judgement) are deceiving me, it's a Franken combination of a two-tone 7A38-7240 or -7260 watch case (light grey dial, with silvery Tachymeter ring), fitted with the off-white 725O Arabic number dial / movement out of a gold-tone 7A38-7280. Un pezzo da non lasciarselo scappare. 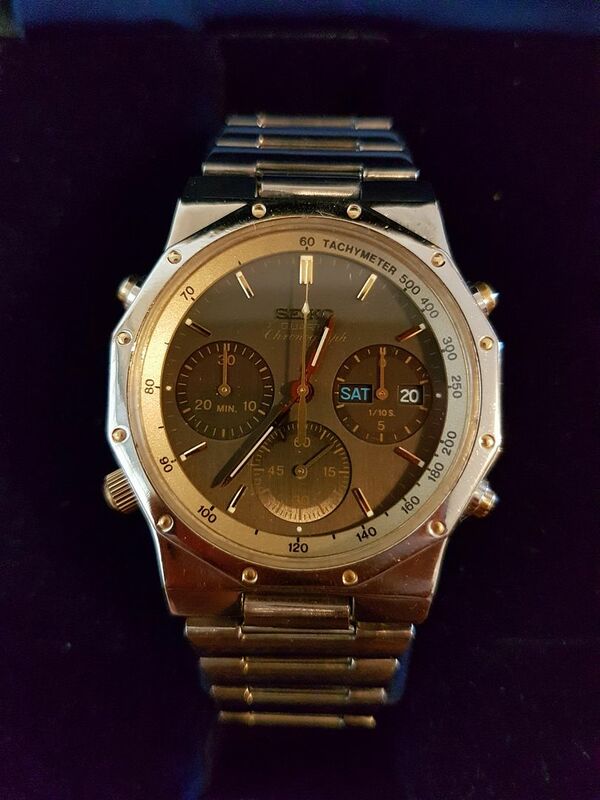 The fact that the devious would-be seller has given his listing such a short (non-model specific) title; there is only one photo and he's used that favourite Italian expression 'introvabile' in his generally vague description, all point to my assumptions being correct. 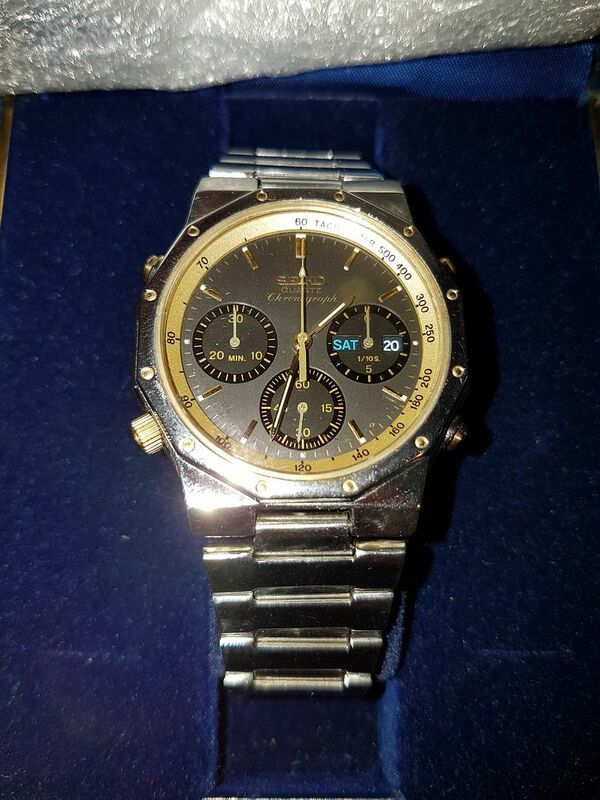 Here's a really nasty Franken - a proper over-polished turd (in the best Filipino watch-botcher tradition) that has just been listed on eBay by that irksome Italian profiteering re-seller cmax-28762. 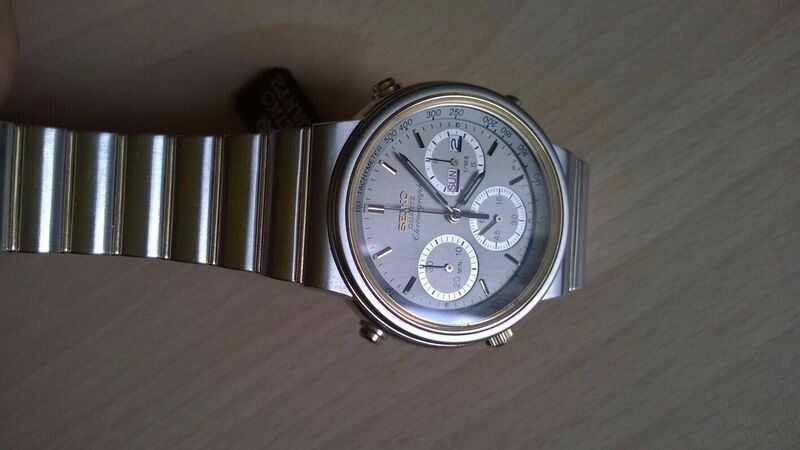 It's based on a 7A38-702H, but has been fitted with the 710L dial / hands / movement from a black chrome coated 7A38-7180. 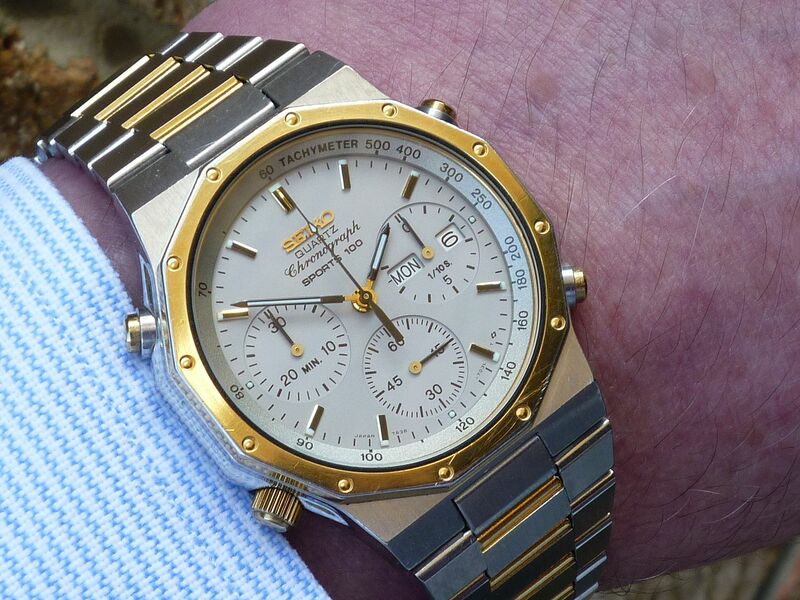 Typically, the 12-sided bezel has been stripped of its gold plating and grossly over-polished - as has the watch case. 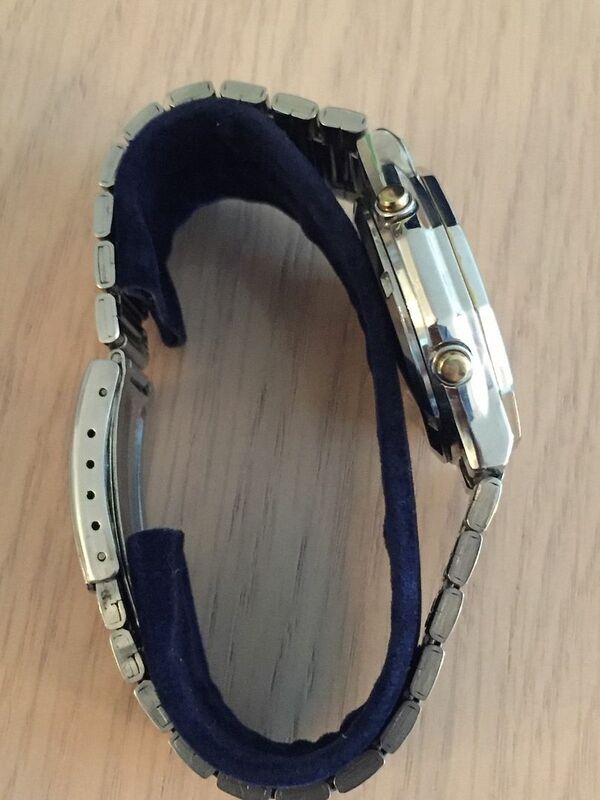 It's fitted with a polished non-original replacement bracelet that's even shinier. 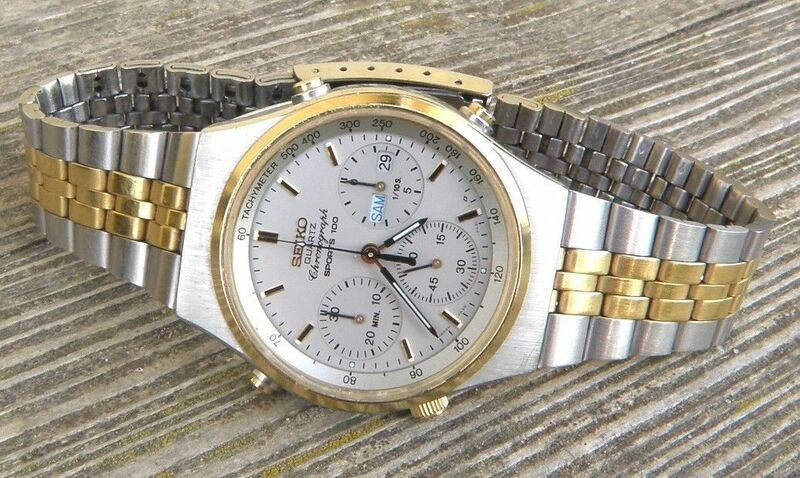 Raro Seiko Quartz chronograph modello 7A38-702H A5 un vero pezzo vintage condizioni molto buone vedi foto tutto funzionante cronometro azzeramento perfetto cinturino originale box Seiko. PS - I doubt very much that it was cobbled together by cmax-28762 himself. 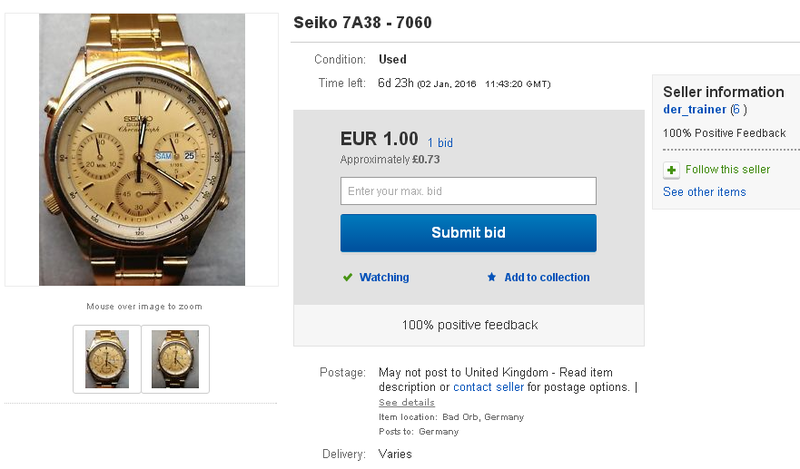 His capabilities seem to be limited to buying watches on eBay, adding a box (any old Seiko box will do) and trying to achieve at least double the price he paid, frequently by using deceptive descriptions - usually starting with a Buy-it-Now price of at least 350 Euros, as he has with this complete piece of junk. After re-listing this horrible over-polished turd of a Franken, umpteen times in the last 4 months, profiteering Italian eBay re-seller cmax-28762 appears to have finally found himself a mug punter ! 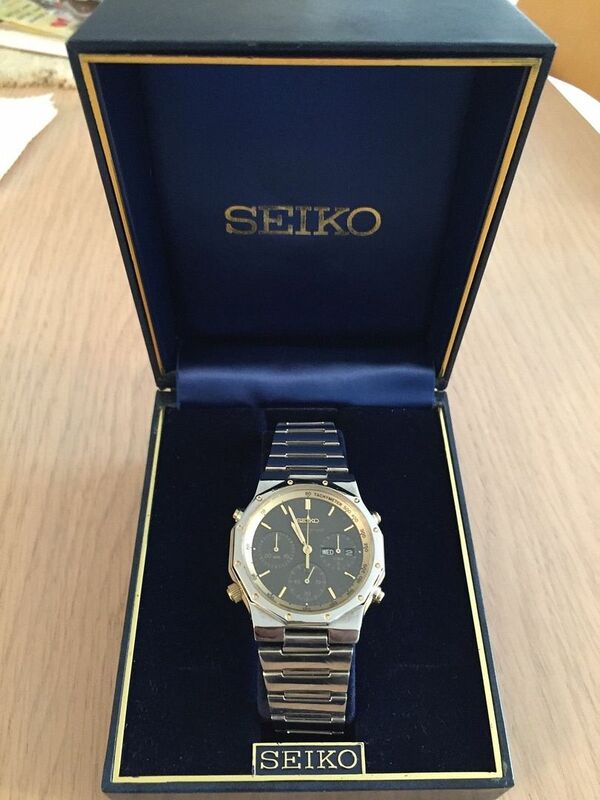 Sold to some poor unsuspecting buyer, less than half an hour ago for an albeit somewhat reduced 200 Euros. Unfortunately, try as I might to forewarn folks about Frankens, not everybody reads this thread before making a purchase. 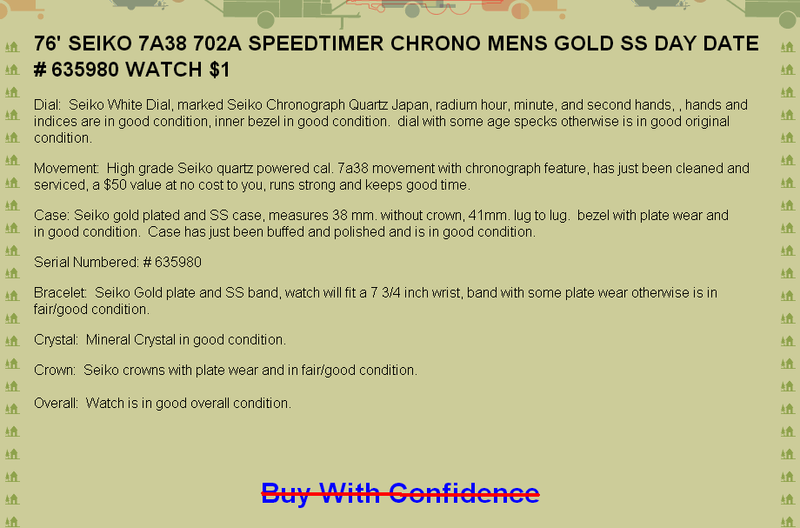 This was posted on WatchUseek a few days ago - the poster 'TheFruitBar' from Singapore has subsequently joined this forum. Sorry, but shiny as it may be (and that's part of the problem), it's a complete and utter Franken. 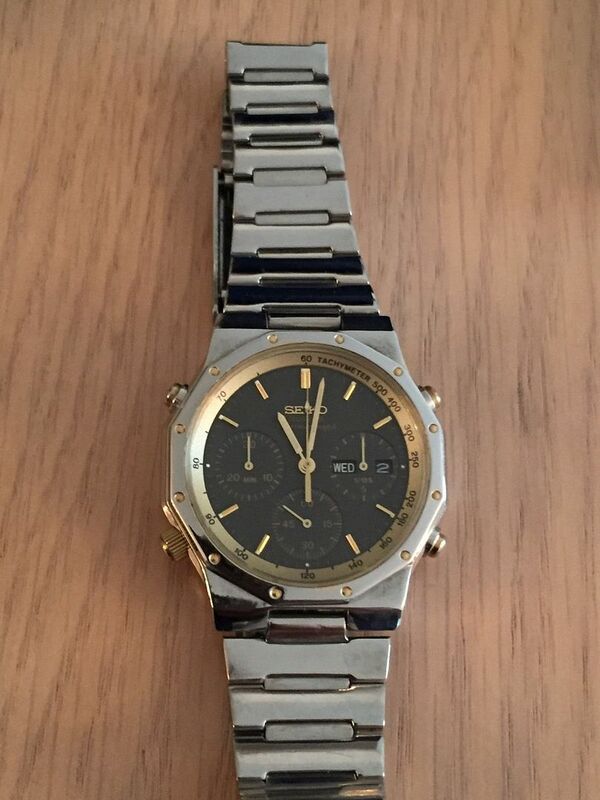 I'd realized a long time ago, that no matter how many salutary warnings I posted in this thread (and the previous one on the RLT watch forum), sooner or later some gullible punter would fall for buying just about every 7A38 Franken that was listed on eBay - no matter how bad or obvious it was. Fortunately, they don't always sell for the inflated prices that their would-be sellers were asking. 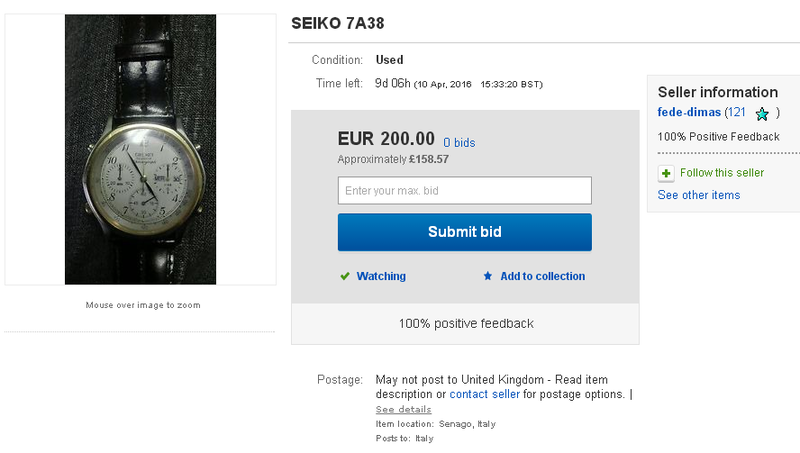 Remember this one, deceptively listed by an Italian eBay seller, simply titled Seiko 7A38, on April 1st (April Fool's Day) ? Needless to say, the would-be seller re-listed it quite a few times over the last 5 months. 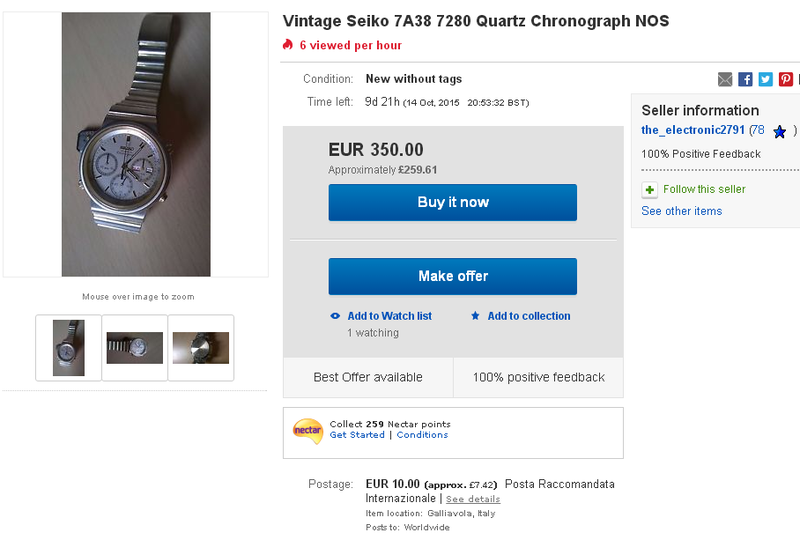 So I felt sure it would finally sell this time around - which indeed it did, yesterday lunchtime - for a mere 52 Euros. There were actually 3 bids placed. 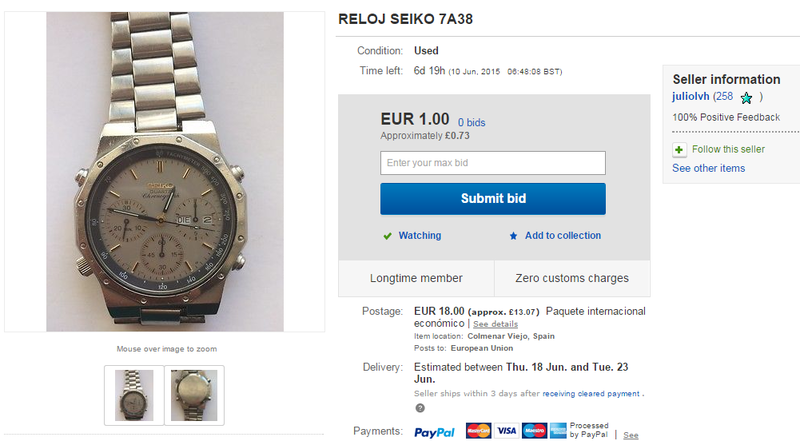 The third bidder retracted his bid of 56 Euros the previous day. 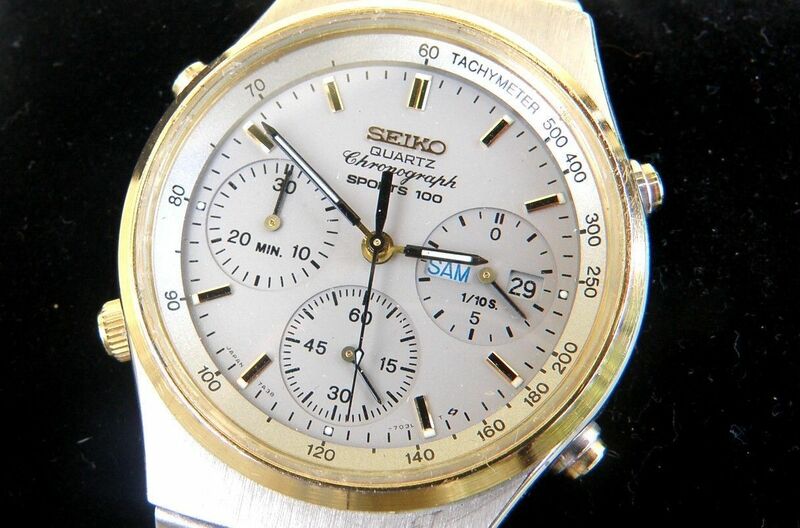 I've always said that subtle Frankens are the best (particulary if they look like something Seiko themselves might have made). 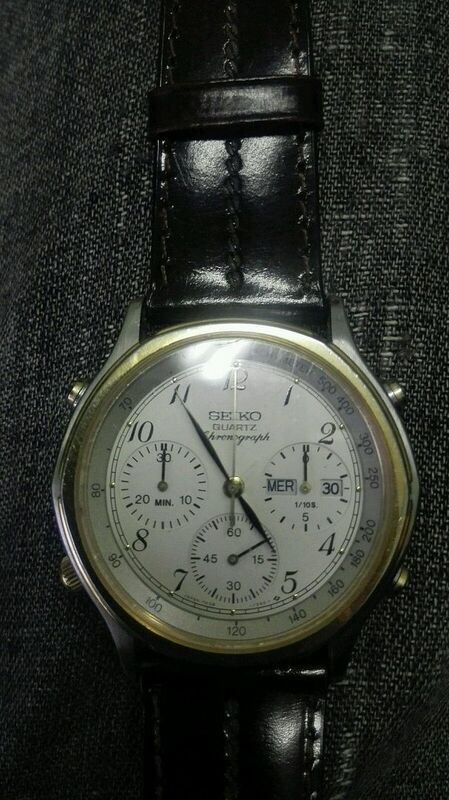 Here's a very subtle one, listed earlier this evening by a German eBay seller, that's almost bound to catch someone unawares. 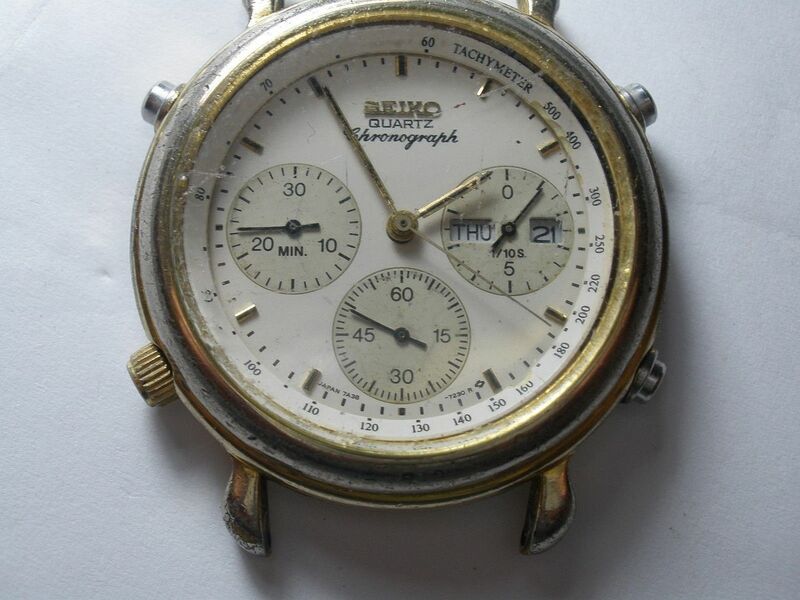 Schöne und Seltene Seiko Chronograph, Day-Date, Japan made. 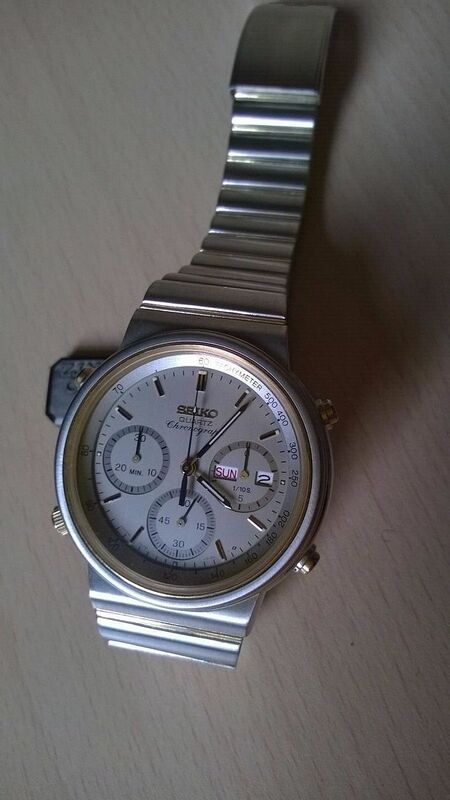 Die Uhr ist in einem guten Zustand. passt für einen Handgelenksumfang bis 21,5 cm. Bitte lesen Sie den Hinweis, Bevor Sie Ihr Gebot abgeben! 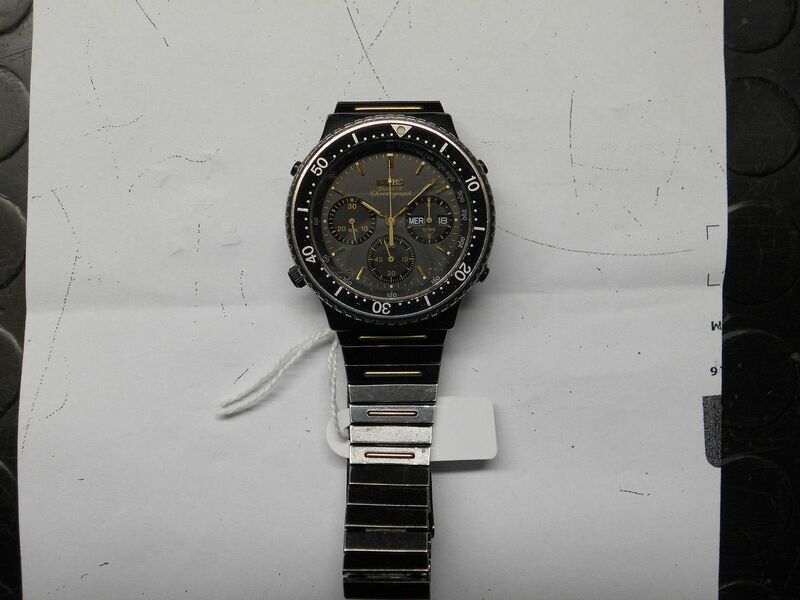 The first clue as to what's wrong and what it's comprised of is the SPORTS 100 logo on the dial (which none of this particular case model have) and 7A38-7020 in the seller's description - which confirms it. 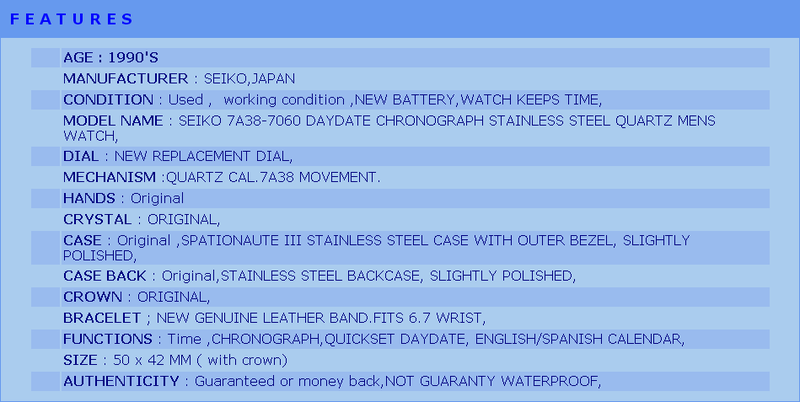 The watch case and matching p/n B1615C bracelet are from either a two-tone 7A38-7270, or more likely the equivalent 7A38-727A, which only seems to crop up in Germany and would also provide the correct silvery-grey Tachymeter dial ring. 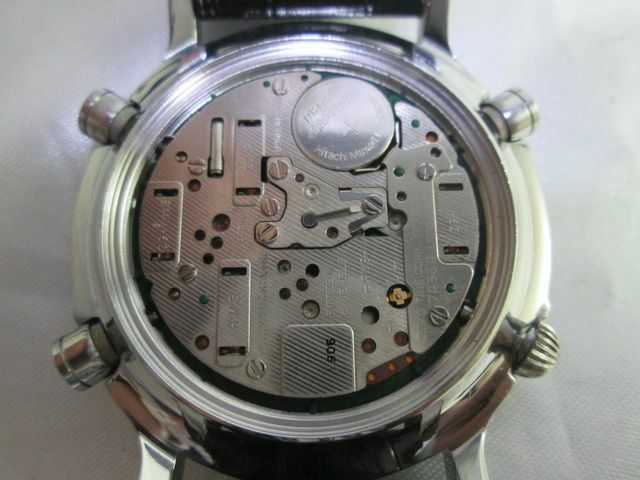 The light grey 703L dial, hands, movement and presumably also the case-back (not shown) are from a two-tone 7A38-7020. 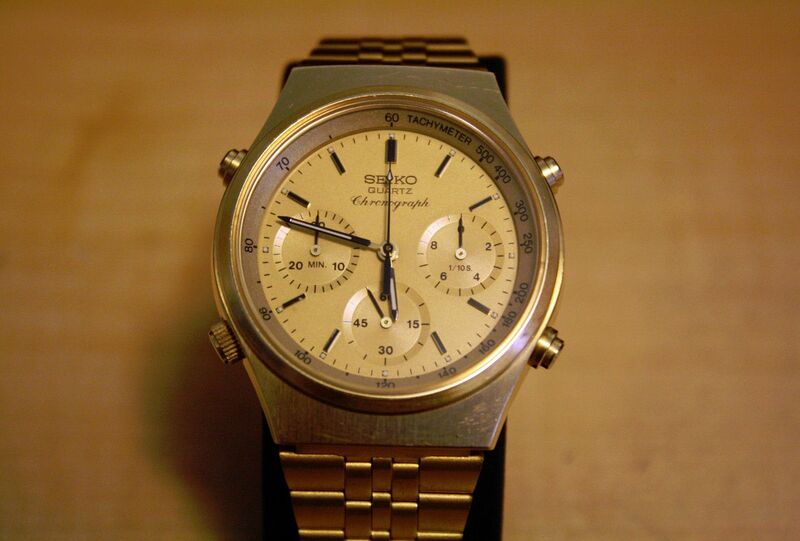 Unfortunately, I don't appear to have a wrist shot on file of my two-tone 7A38-727A, but it's the watch on the right of this old photo. Like I said - it's very subtle, innit ? 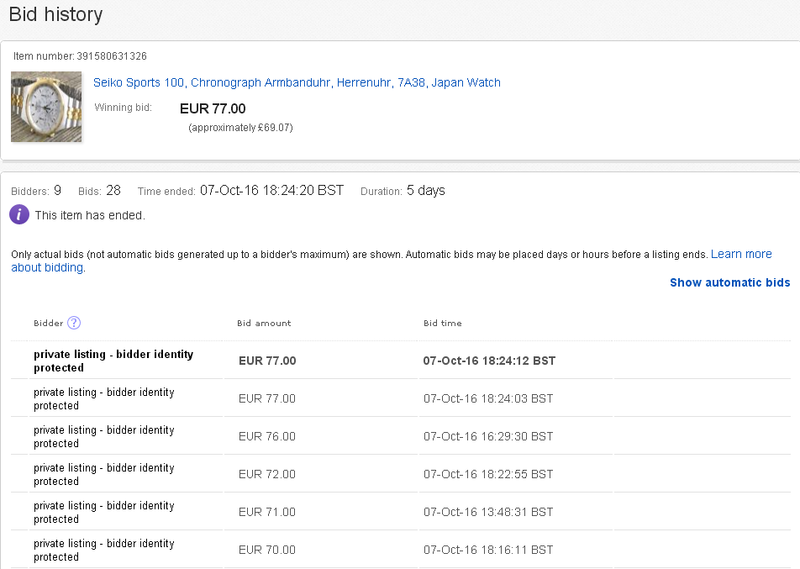 That said, despite all the attention, thankfully, it only made 77 Euros (approx £69). This is another deceptively mis-represented Franken, that I'd intended to write up yesterday, but didn't find the time. Subtitled: When is a 7A28 not a 7A28 ? 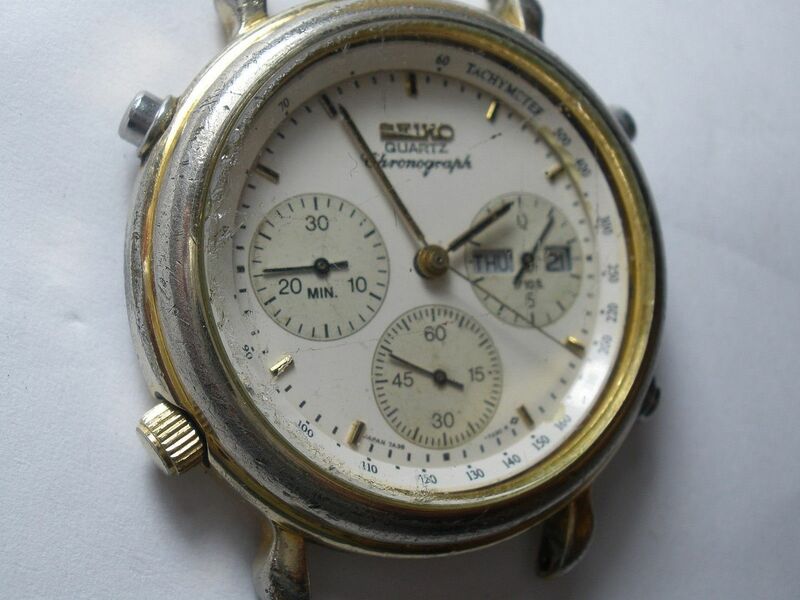 This abberation was listed on eBay in the States, a couple of days ago by re-seller worldwideweb66 (a.k.a. Wai Phyo from Daly City, CA) - a person who can sometimes be rather economic with the truth in his often fanciful descriptions. 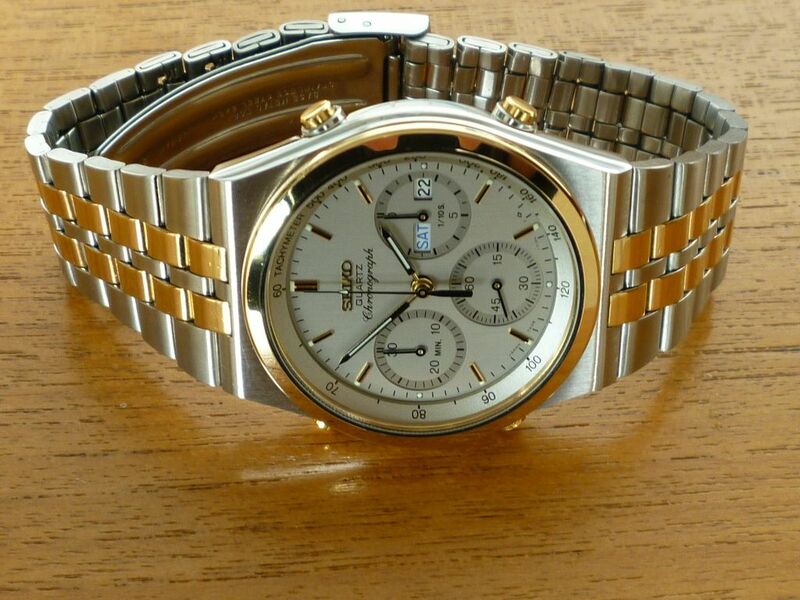 Although not an unattractive little watch, this is a bit more than a 'Mod'. I'd call it a complete and utter Franken. 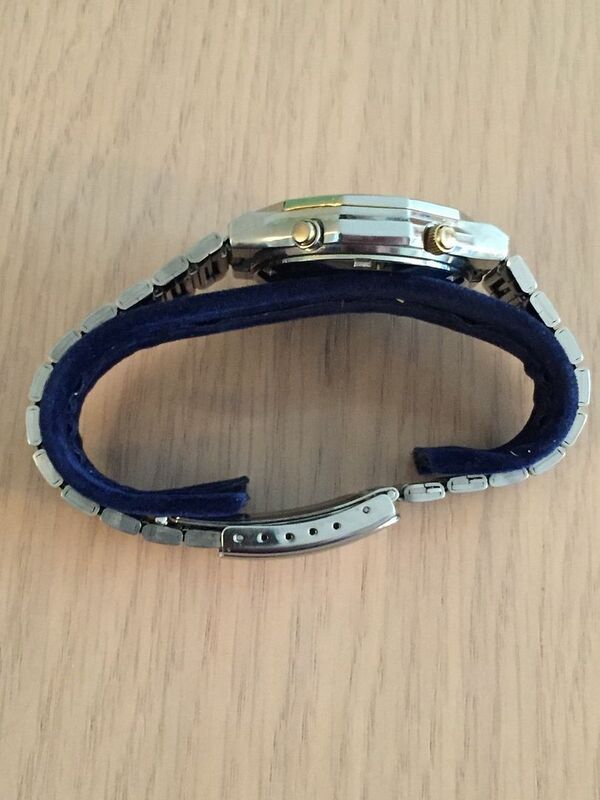 The watch case and p/n B1615G bracelet are from a gold-tone 7A38-7270 (of which he conveniently omits to state). 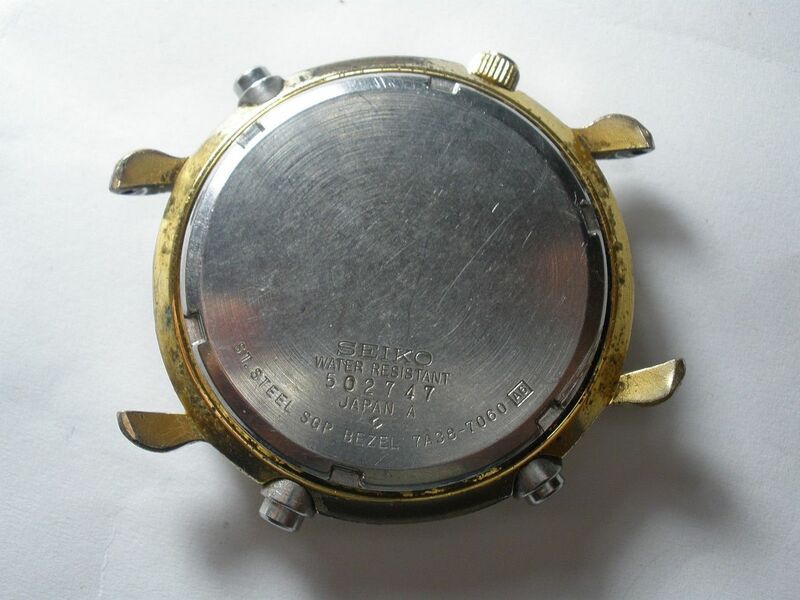 The gold 702L dial, presumably 7A28 movement and case-back being from a common-or-garden 7A28-7029 donor. It's academic now, anyway. 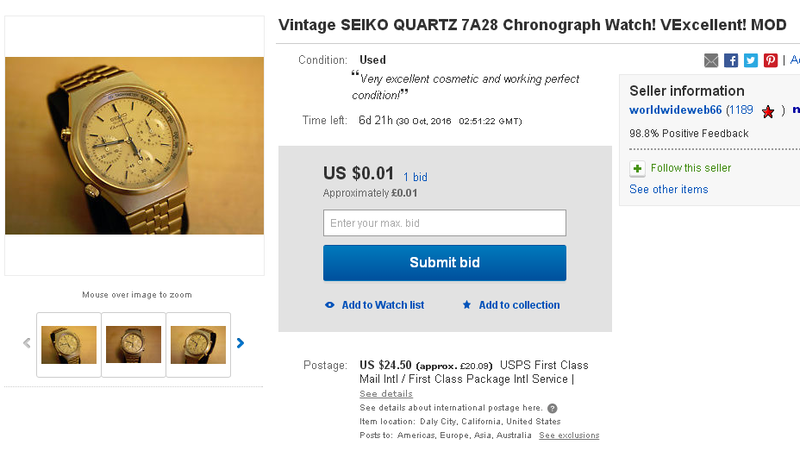 The listing was only for three days and Wai pulled it in the early hours of yesterday morning.